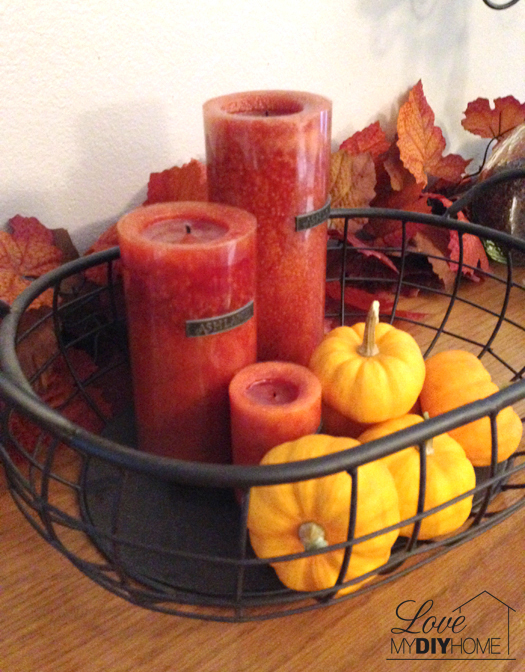 A fall tablescape isn’t just for your dining room – how about your couch table, bedside table, or front door accent table? So many tables. So many ideas. Use them all. This fall arrangement is on a buffet at my front door. You know, I’ve found it gathers much less, “junk” when I’ve decorated it for the season. I suppose it’s because the “junk” so detracts from it’s prettiness that I’m much better at keeping it cleaned off. Who’d have thunk it? The bottle above came from the limo that my DH drives as a part-time job (free). We’re not ones to buy alcoholic beverages, but that doesn’t mean I can’t appreciate a decorative bottle. 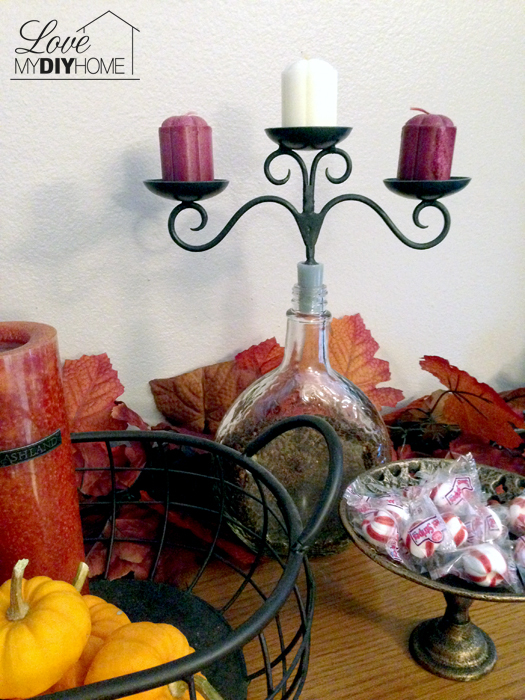 I peeled off the labels and filled it with whole cloves and topped it with a candle holder ($12) I found in a little shop in a little nearby town. 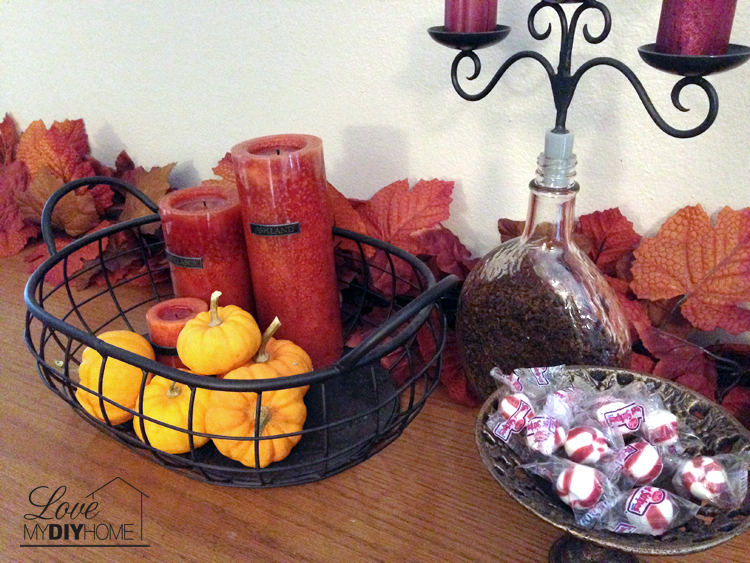 The little candy dish was a clearance find in a second hand shop ($2). 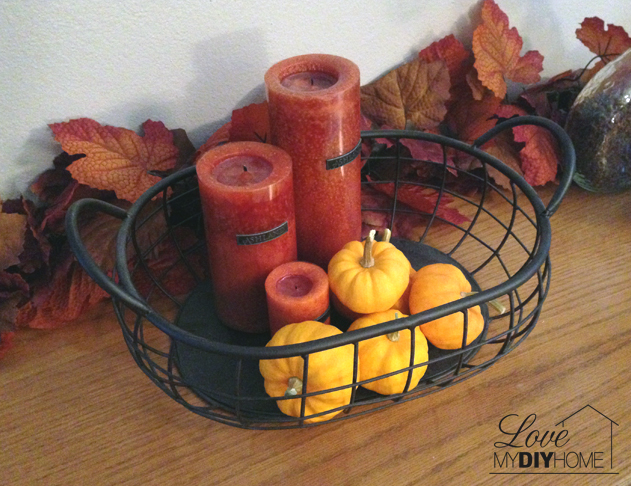 The metal basket was a Hobby Lobby clearance find ($16) that I bought and had no idea where I was going to put it. The candles were from Michaels day after Christmas sale last year ($2). The pumpkins came from our garden this fall. The leaf garland is from Michaels fall clearance last year ($3). See how I didn’t just go out and buy everything at once for full price? 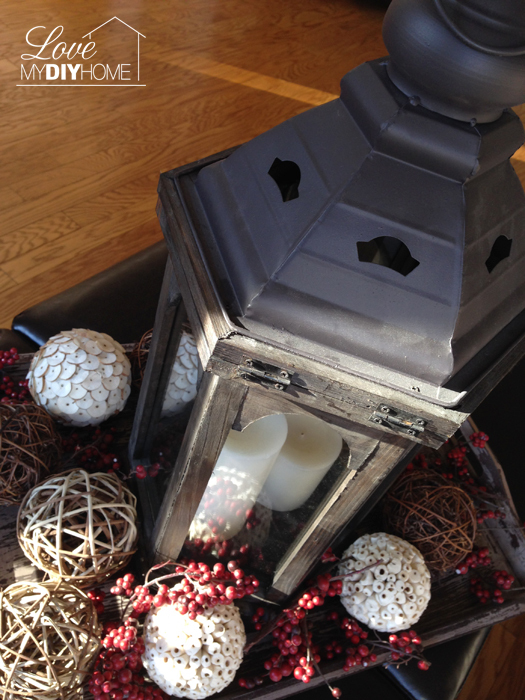 It takes time to build your decor accents, but then once you have them, mix and match and get creative. Seriously, it’s easy, peasey. How about you send me some of your tablescape creations? You just might get featured! A tablescape doesn’t have to be on a “real” table. How about a padded storage seat that is used for a coffee table? My friend has an obsession with lanterns. What floats your boat? Or, in her case, what swings your lantern? Look around, get ideas, go shopping and pull it all togther. I’m sure that if I sold all my baskets and lanterns I could make my house payment next month. I told my friend today that even after lanterns go out of style I’ll still have them all over my house. Some things must just be. Don’t try to fight it. Just go with it. Just beautiful – and inspiring – as always, Val! I love the latern vignette. And the lighting on the photos is perfect, making it just that much more lovely. That drink bottle caught my eye right away and I was wondering where I might find something similar, but there's no limo drivers around here! 🙂 I'm sure if I keep my eyes open I could probably find something great too. I would have never considered that lovely idea and am so glad you shared it. 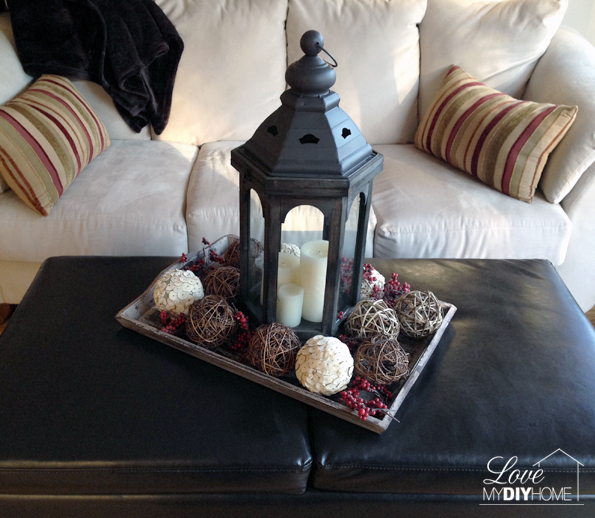 I have a sofa table that I love to add decor to, but it loves to collect junk too if I don't keep it well-decorated. Right now it's adorned with school books and a few tired squashes and pumpkins – it's time to do some sprucing up. Thanks for sharing another great post – and for the update on your mom. God is so very good! Karen, I just asked my DH to bring it home if he ever sees another one like that and I’ll send it to you! And yes, God is so very good. I'm so sorry to hear your mom had bypass surgery! I hope she recovers quickly! Sending prayers to you and yours. I love your fall decorations! I agree with you-a centerpiece doesn't have to be for the dining room! Thank you for sharing on The Wonderful Wednesday Blog Hop! Blessings, CD. Thanks, CD. She is progressing, slowly, and thanks for stopping by. I loved all the fall photos you put on your site – fall is such an inspiring season! There's some really great ideas! Sometimes I get stuck and have no idea how to decorate for seasons. Thanks for sharing. Sharon, it’s fun to decorate for the seasons, but don’t feel you have to do some big designer decorating extravaganza. Find things you like and put them together – to please yourself. It’s all about enjoying your home, not making it a show piece. Your table accents are beautiful. I also buy in spurts to get the best deals. 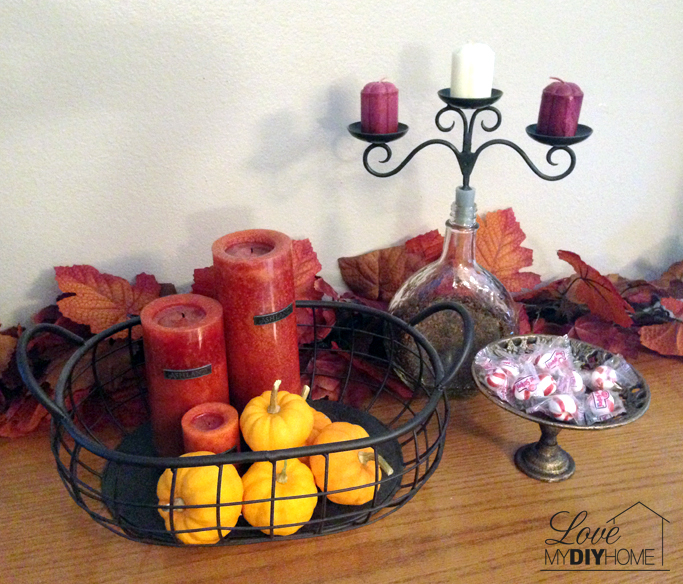 I just finished my own fall table and decorating with a couple of items on hold for Thanksgiving. I love the colors of fall, too. @Flortec, I’d like to see pictures of your fall table! Stacey thanks for coming by. I enjoyed your story about your bloggy meet. I’ve not met any bloggers in Wisconsin yet. I hope to connect up some day with someone nearby. BTW those huge leaves were really cool! 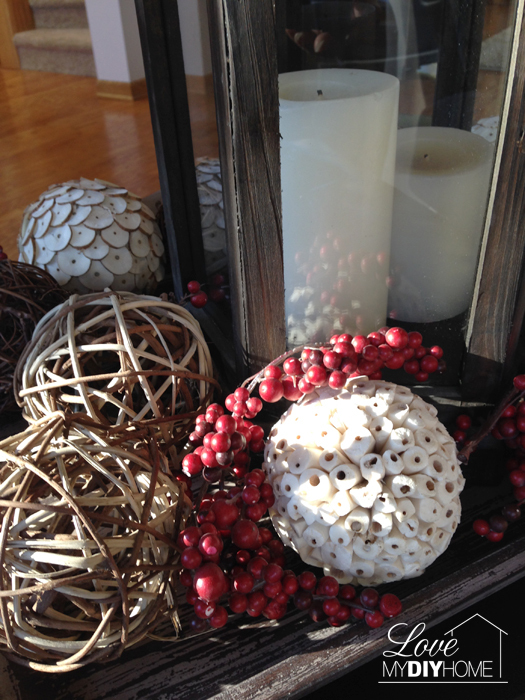 I like how you can take a few simple objects and make your home feel so festive for the holidays. I love that you were able to do it by finding items on sale. Thanks so much for linking up with us at the #SHINEbloghop. I pray that your mother recovers quickly. Thanks for visiting, Heather. I liked the post about “God is for us.” It is so true and always nice to see others who believe also. I liked your banner with the coffee cups – love me some coffee!! Congratulations! You've been featured on Wicked Awesome Wednesday! 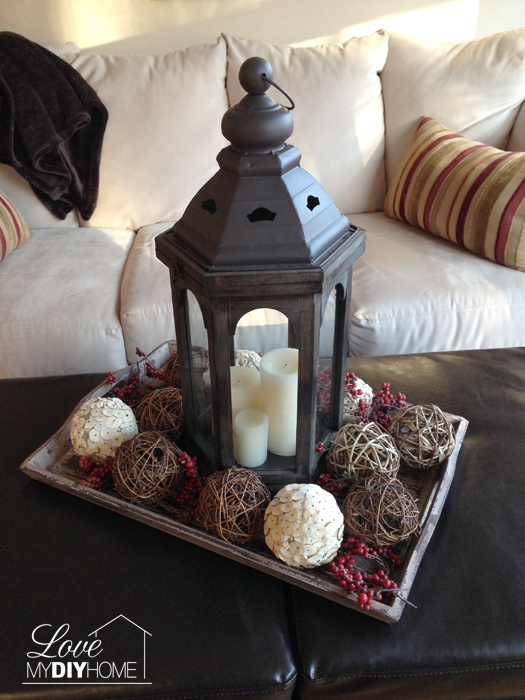 Thank you for sharing your centerpiece and mantle decor ideas. Feel free to stop by the website to pick up your "I've Been Featured" button! 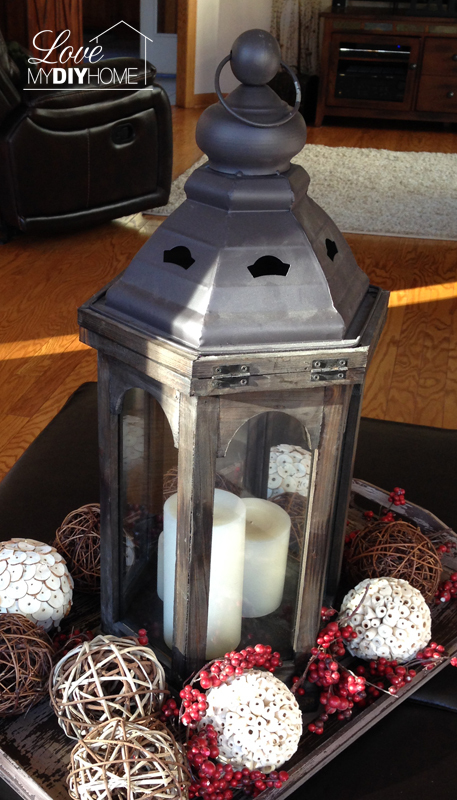 I love the black metal basket and the lantern. I'm a huge fan of black metal and both of those pieces would easily fit in my home. Thanks for sharing and thanks for linking up for Scraptastic Saturdays. This post will be shared via FB/Twitter/Pinterest. Have a wonderful day. Hope to see you Saturday. Thanks, for coming by, Andrea, and for sharing my post. I will definitely be back! Just visiting from the link party. Wow, that is an ordeal. It's good to hear your mother is doing well. Prayers going out for her. Your tablescapes are quite lovely. Thanks Theresa! My mom is doing well. Glad you visited. Loved the pictures of your black petunias, but the mums and orang daisies were my faves!